My Uncle George passed away in November of 1964, he enlisted in the Merchant Marines at 17 years of age and traveled the world. He would occasionally call us from his latest port of call and tell us about the people he met, the cities he had visited and where he was sailing next. 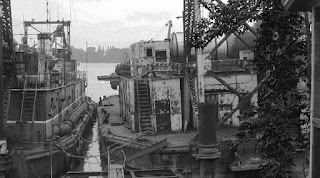 Among his souvenirs I found a photograph of what looked to be a barge, there was no description save the name Manseau No. 101 Dipper Dredger. 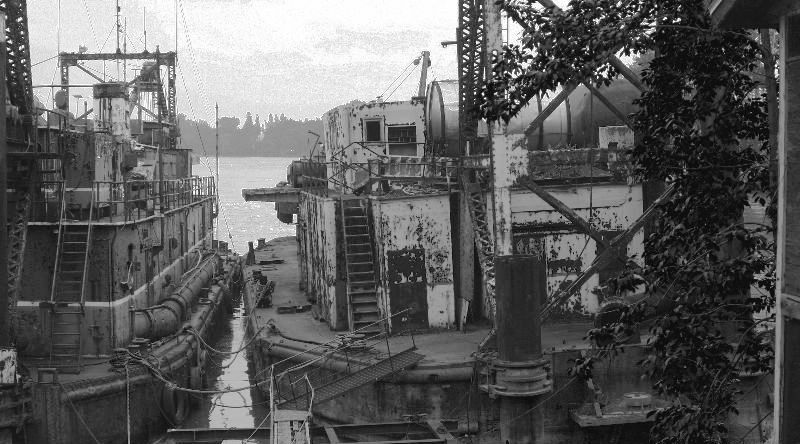 It was a 10 cubic yard dipper dredger, one of the two largest dredges in the world. The dredgers were all run out of Sorel, Quebec owned by Marine Industries, Ltd.
Sorel, Quebec was not that far from where my uncle lived in Montreal. My assumption is he traveled to Sorel, possibly took some training there and off he went to sail the high seas. His favorite country was Spain. The Manseau No. 101 was scrapped many years ago.